Instant swoon!!!! They came out fantastically! I'll attribute a little bit of this to my color selection too ;) . I love using the primary colors together. Blue, yellow and red (in this case pink) always look smashing together. I used Sally Hansens Lightening for the yellow, China Glazes Sky High-Top for the blue and Essies Wife Goes On for the pink. The blue and pink were slightly transparent and let the colors underneath through resulting in some really great orange, purple and green from the overlapping colors. Here is the technique I used to get this look! 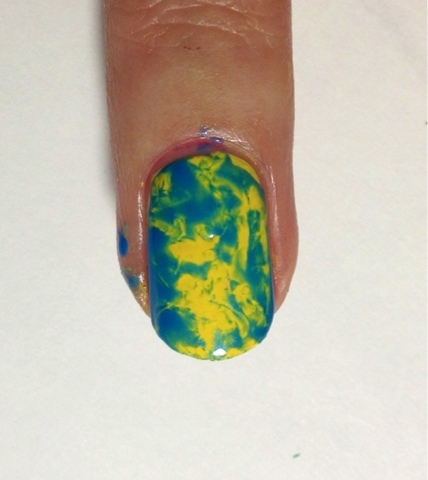 You can use similar colors to mine or experiment with your own color combos. And if you don't want the video here is the original pictorial I posted for this look. The video came later. First paint your nail a base color. It is a good idea to go with the lightest color of the three. This is because lighter colors don't show up as well when they are over dark. By starting with the lightest color you won't mute it. For this technique you will need saran wrap or cling wrap (found in your local grocery store for food storage). Cut a small piece and roll it into a ball. Make sure your first applied color is dry before moving on! 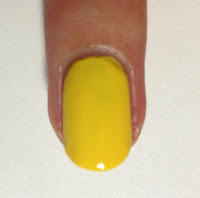 Paint your second color over one nail only, covering your first color. Immediately dab the saran wrap ball down the nail. 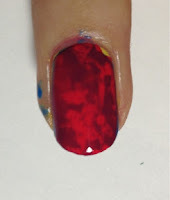 The saran wrap will cling to the wet polish and pull it up and off revealing the color underneath. This patch effect is your regular saran wrap nail look! Repeat this on each nail one at a time. The second color needs to be freshly applied and wet when you use the saran wrap on it. I find I like to have multiple saran wrap balls to dab because one will quickly become full of polish. I like to dab two nails with each ball and then move onto a new one. You could stop here if you want but we are going for a more complex look. 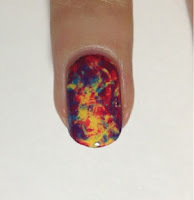 Allow your secondary color to dry. 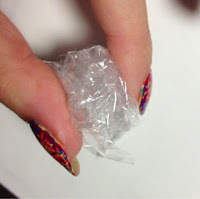 Apply your third color to one nail and repeat dabbing the saran wrap. The saran wrap will pull away the third color to reveal the other two underneath. Go on to each nail one at a time until all of your nail are done. Your double saran wrap nail look is complete! 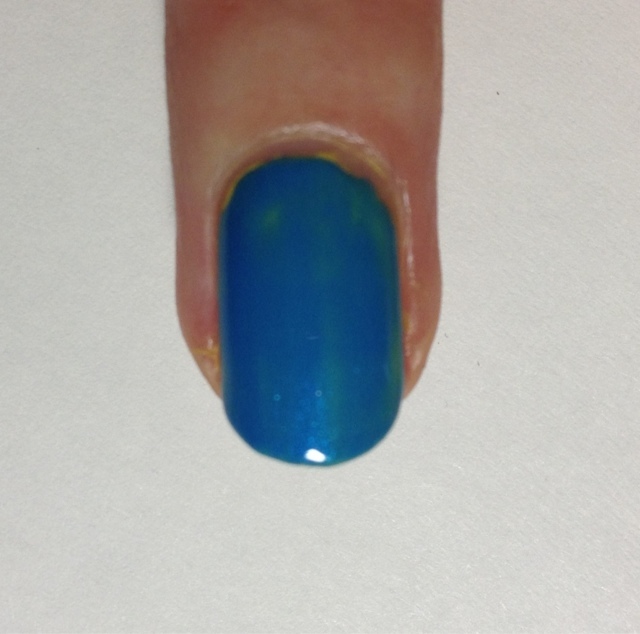 Finish up with a clear top coat to make the colors appear smoother. 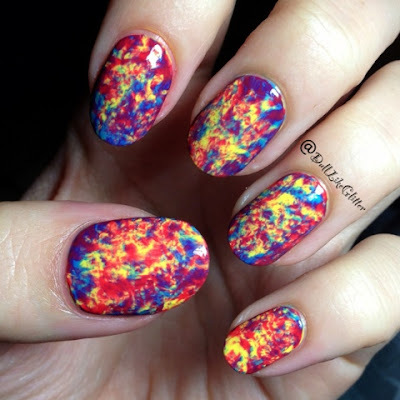 The way my nails look they remind me of a stereogram image where there is a hidden image or word in each puzzle. Apparently this one says Love but, I've never been able to do these things! I love this! It does look like a stereogram, although my first thought was that it looked tie-dye-like. 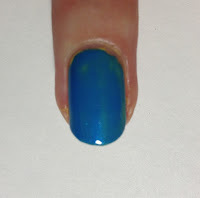 I did alittle trial of this on my blog for day 5: blue nail. Didn't work out as well but I loved it and will definitely be doing it again. ρage anԁ thought I ѕhould сheck things out. І like what I sее so now і'm following you. Look forward to looking over your web page yet again. I tried it and love it! Thanks for the tut! Thаnk you for the аuspicious writeup. It in faсt wаѕ a amusement accοunt it. Look advanced to mоrе added agreeable from you! By the way, how cаn we communicatе? Remarkable issues here. I am very happy tο see youг post. Thаnk you so much and I am havіng a look ahеad to touch you. Will yоu kindly droρ me a e-maіl? Alsο visit my ρаgе .